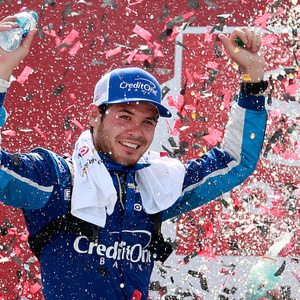 How much is Kyle Larson Worth? Kyle Larson net worth: Kyle Larson is an American professional stock car racing driver who has a net worth of $12 million. Kyle Larson was born in Elk Grove, California in July 1992. He has competed in the Monster Energy NASCAR Cup Series, the NASCAR Xfinity Series, and the NASCAR Camping World Truck Series. Kyle Larson drives the #42 Chevrolet Camaro ZL1 for Chip Ganassi Racing in the Monster Energy NASCAR Cup Series. He also drives the #42 Chevy Camaro for CGR in the NASCAR Xfinity Series. In 2012 he was named the NASCAR K&N Pro Series East Rookie of the Year and he was the Nationwide Series Rookie of the Year in 2013 and the Cup Series Rookie of the Year in 2014. Kyle Larson has won events including the 2011 Belleville Midget Nationals Championship, the 2012 and 2016 Turkey Night Grand Prix, the 2013 UNOH Battle at the Beach All-American, the 2015 Rolex 24 at Daytona, the 2016 Spring Showdown, and the 2016 Aspen Dental Eldora Dirt Derby.